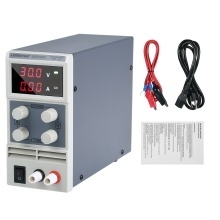 This mini DC power supply is a single set of output, high precision double display switching DC power supply. The machines have complete operating protection function, with high performance, low ripple, high stability, light weight and small volume etc. Current limiting protection can make the power supply and load against accidental damage. This power supply with low temperature control circuit, and the noise of cooling fan is low. Double LED 3 digits display of voltage and current, high precision. Dual voltage input and convenient choice(110V/220V ±10%). Voltage setting switch is at the back. Incorrect choosing the input voltage will damage the machine.